Filed to: the venture bros.Filed to: the venture bros. So that’s what happened to the teleporter. All this time, I assumed the Monarch and Gary would’ve kept it to themselves for their own plans, but it turns out they handed the discs over to the Guild. Which makes sense; after spending last season trying to circumvent Guild protocol, the Monarch has spent season 7 being a good little boy again, more or less following the rules with some surprisingly positive results. After years of being an outcast, “The Saphrax Protocol” finds the villain once again ascendant, going through a time-honored ritual to become a level 10. It’s a vital turning point for the character, indicating that he and Gary (promoted to official Number 2) will no longer have to spend their time slumming for arches. But that’s nothing on the episode’s biggest twist—a twist that barely has time to register, feels like it’s been coming for ages, and somehow manages to revitalize the entire series in one fell swoop. Well, that’s a little unfair; season 7 was strong enough even before we learn that Rusty and the Monarch are blood relations, and it would’ve still been one of the show’s best even without that twist. 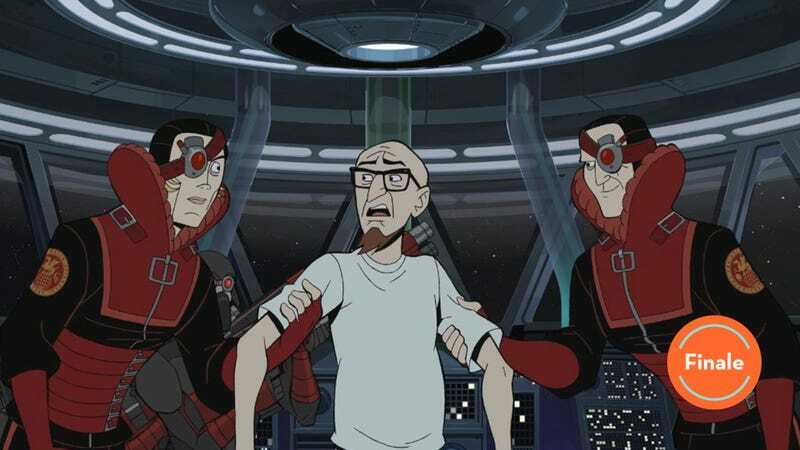 After a decent but surprisingly forgettable season 6, this summer found The Venture Bros back to doing what it does best, and “Saphrax” continues the trend. I’m not sure if it’s one of the best episodes of the season in its own right, but it is very good; and more than anything else, it clarifies and contextualizes everything that came before it in a way that’s thrilling without being overly didactic or belabored. Hell, if you aren’t paying close enough attention, it’s possible to miss what’s being strongly implied here—and I’m pretty sure that even if you did miss it, you’d still have a hell of a time. The Monarch’s seemingly inexplicable hatred of Rusty Venture has been one of the show’s longest running gags. It was the sort of joke that you never really wanted explained, like finding out who Hank and Dean’s real mother was. (We apparently get her name this episode, coincidentally enough.) Yet the characters have developed enough by now, the show has been running long enough, that it makes sense to finally start to pull back the curtain a little. “Saphrax” doesn’t explain what drives the Monarch—you get the feeling he doesn’t really know himself. But it suggests an idea. And the way that idea works in conjunction with one of the other season’s on-going plots is… honestly, kind of astonishing? While the Monarch and Gary go through a series of tests to earn their big promotions, and Brock cheerfully murders a hapless team of Guild operatives, Hank is in the hospital. Turns out his head injury from last week was even more serious than we realized. Or maybe it was the shock of seeing his girlfriend in bed with his brother. Whatever the cause, he’s in a coma, and Dean is sitting by his bedside, reading a long list of all the reasons why he (Dean) is a terrible brother. It’s silly and embarrassing and endearing, and it also underlines something that’s been happening naturally for a while now. Hank and Dean Venture’s corniness was as much a running gag on the show as the Monarch’s hate-on for the Doc. Much of the early seasons’ humor stemmed from contrasting the Venture brothers’ childish naivete against the unpleasant awkwardness and violence of the real world, and, as obvious (and mean-spirited) as the joke often was, it set up an idea that would serve as a cornerstone for the series as a whole: the way boys and men (who were still boys at heart) routinely retreat to the simplistic, self-serving worldview of pulp and comic book adventure stories in the face of a complicated, uncaring reality. But as the show developed, Dean and Hank became more than just punchlines. Once they stopped dying and getting cloned, they actually started to grow up. And when you grow up, you often grow apart. It’s been happening to the two for a while now, and Dean’s letter, and his efforts to reconnect with his brother, more or less confirm it. That’s good character development, and the fact that the episode ends with Hank determined to go off on his own to find himself is both hilarious (that Batman mask reveal at the end is maybe the funniest joke of the season?) and surprisingly bittersweet. He doesn’t seem particularly resentful of Dean, but he also leaves the hospital without saying goodbye to his brother. That’s not heartbreaking or anything, but given that their relationship has been one of the show’s most consistently nice things, it is more than a little sad. It’s also fascinating, given the context, and what it suggests about the nature of the Monarch and Rusty’s feud. Because it’s not a coincidence that we’re seeing Dean and Hank split in the same half hour when we learn that Doc and his bitterest enemy are blood relations. We still don’t know much about Rusty or the Monarch’s childhood connection, but the clues that have been dropping (especially this season) build a certain picture, one that might foreshadow bad things in the road ahead for Hank and Dean. Who knows if next season will double down on this, or if it’s just something left in the air, but the idea that the Monarch and Doc were once as inseparable as the Doc’s sons feels right in a way that doesn’t really need confirmation. If nothing else, it explains why the Monarch has been obsessed with him for so long—when you turn on your brother (half or otherwise), you turn hard. That’s a great way to end a great season, one that had the show rediscovering the ideal mixture of world-building absurdity, nerd riffs, and unexpected sentiment that it seemed to have misplaced two years ago. 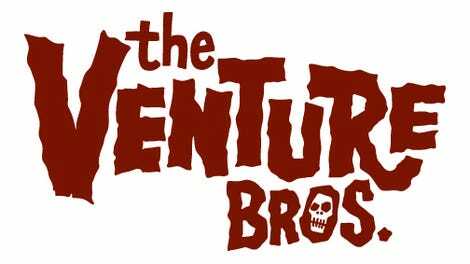 When that season ended, I was left wondering if The Venture Bros. might finally have worn out its welcome. This time around, when the credits promised that the show would return, I practically cheered. It’s good to get the occasional reminder that, good guy or not, Brock Samson is a psychopath. The only part of this that didn’t work was Sgt. Hatred’s attempts to “seduce” the night nurse at the hospital into letting him see Dean. It just wasn’t very funny. Hank’s coma vision has him cosplaying as Lando Calrissian; he runs into the Action Man (who’s in a coma from a stroke), and Phage (who’s there thanks to some uncomfortableness with the transporter). The Empire Strikes Back/Barbarella gags are all great, particularly Hank’s decision to try and seduce the wampa. Saphrax and Alatheus are apparently real people, although I’ll leave it to someone more versed in history to summarize their Wikipedia entry. “I’m jealous that you don’t care you’re dressed like Batman in public.” -Dean, to Hank.